On the first day of my cross-cultural communication class, Professor Javidan started class with an example of a man named Joe Blue. While Joe’s culture is a very important part of who he is, it is not the only thing he is made of. Everyone has a different “chemical combination” of personality, culture, ideas, family influence, hobbies, beliefs, values, etc., that make up someone’s identity. Not everyone from the same culture behaves the same way, because the essence of a human is made up of so much more than one thing. I attribute a lot of political problems in America to the concept of identity. A person may believe in something so strongly that they forget it is an opinion, and that others may see something completely different. When your ideas and beliefs become a part of you, anyone who disagrees with these ideas disagrees with who you are. This can lead to extreme emotional reactions. Let’s break this down. First of all, safety from “threatening actions… and conversations” is absolutely necessary (we will come back to “threatening ideas”). People have the right to physical safety no matter where or who they are. What I take issue with are the bolded words: “…free of bias, conflict, criticism, or potentially threatening actions, ideas, or conversations.” I don’t believe it is reasonable to expect anyone to be free of bias. Even the staunchest Independent will still lean a little to the Left, Right, Green, Libertarian, etc. Expecting someone to be free of bias is a problem. One of my close friends follows some “thought leaders” who he believes are unbiased. The problem is, they are VERY biased. He regurgitates what these speakers say, and then is confused when people don’t automatically accept their opinions as undeniable truth. Next, freedom from criticism. This is perhaps the issue that grinds my gears the most. As I already mentioned, people integrate their beliefs and opinions into their hearts, minds, and souls. Therefore, when you criticize this idea, some people view it as an attack on their person. We need to separate our identity from the issues that we discuss. Without criticism, we would live in an echo chamber surrounded only by those who agree with us. This contributes to the nasty political divide between conservatives and liberals. If you look at Fox News or CNN, you will mainly see ideas that follow the agenda of the respective political parties. Very rarely are ideas met with coherent counterarguments, without conversation devolving into a shouting match. These Safe Spaces create a place where only one point of view is accepted. Universities are supposed to be centers of knowledge and discussion with freely flowing ideas. It is the one place where you should be able to challenge any perspective. Finally, the concept of “threatening ideas”. I subscribe to John Milton’s “Marketplace of Ideas“. If you are not familiar with this theory, it is a “rationale for freedom of expression based on an analogy to the economic concept of a free market”. It has been used in legal cases and championed by Supreme Court Justices. Basically, all ideas should be allowed to be shared. Much like the best product in a free economy, the best ideas will emerge when there is honest and public discourse. The very existence of an idea (assuming it is not a call to violence/discrimination) should never threaten anyone. 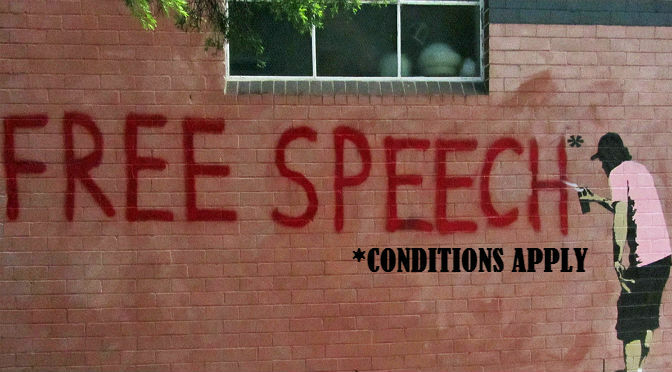 To protect free speech, I challenge you, the reader, to do three things. Be mindful that you, and everyone you talk to, have ideas that are internalized and made a part of who you are. Make an effort to separate the issue from the individual. Focus on seeing the issue for what it is, and not who is presenting it. Be kind and respectful when disagreeing with someone. Don’t attack their identity, but don’t be afraid to challenge an idea. What Does It Take to Have Executive Presence?